There are six species of flamingos that remain on the Earth today. While they are all similar in basic ways, there are enough differences for them to each have their own category as well as name. Their bright pink color and wading ways makes them stand apart from the some 10,000 different species of birds in the entire world. While their namesake suggests that the American flamingos are present in all the continent, they are much more common in the Caribbean and islands surrounding the Southern Americas. The beaks of the Andean flamingo are a black and yellow color, yellow closest to the face, descending into black as you get closer to the tip of the beak. The most distinguishing characteristic of the Chilean flamingo, over its other widespread counterparts, is the pink “cap” that covers its ankle joints. They feed on small invertebrates that they pick up from the mud and water of the lakes and lagoons that they inhabit. The James’s flamingo has the finest filtering mechanism of any of the flamingo species, and have more of the gummy flaps than their counterparts, up to twice as many. 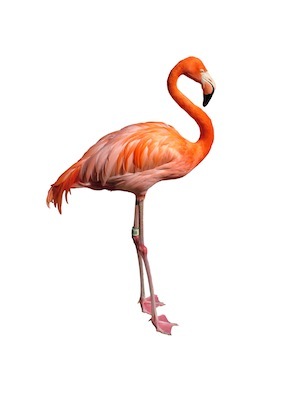 The Lesser flamingo is the smallest of all the six different species of flamingo, standing a little over two feet tall, and weighing at maximum, six pounds.